A BMW on Signal Mountain Blvd. is seen this morning, crushed by a tree that fell during heavy overnight rain storms. Document: Roads blocked as of 1 p.m. Roads blocked as of 1 p.m.
A record-breaking rainfall cascaded down in sheets and torrents Monday, straining dams and threatening new flooding in low-lying areas today despite ground that had been starved of moisture for weeks. The remnants of Tropical Storm Lee, which arrived Sunday, could dump a total of 10-11 inches of rain on the Chattanooga area by tonight and cause more regional flooding, according to forecasts by the U.S. Weather Service and the Tennessee Valley Authority. "[There's] rain, rain and more rain," said forecaster Nate Mayes with the National Weather Service in Peachtree City, Ga. The storm had deposited 8.16 inches of rain at the Chattanooga Metropolitan Airport as of 5 p.m. Monday, an amount that broke the 24-hour local rainfall record of 7.61 inches set on March 29 and 30 of 1886, according to the National Weather Service. 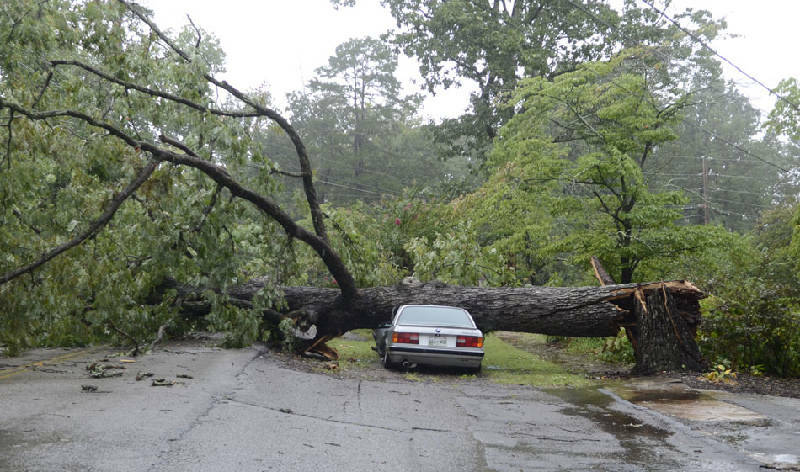 Lee wrecked havoc on Labor Day throughout the Tennessee Valley as more than a thousand Soddy-Daisy residents lost power, and Catoosa County, Ga., suffered a five-hour telephone blackout after Ringgold Telephone Company lines went down at noon, police said. EPB crews prepare to repair powerlines and restore power Tuesday on Tremont Street in north Chattanooga. Several hundred Volunteer Energy Cooperative customers in Hamilton, Meigs, Polk and Bradley counties were without power Monday evening, spokesman Robert McCarty said. He said crews were working to restore service as quickly as possible. In Chattanooga, officials cordoned off roads as municipal drains clogged and water pressure forced manhole covers from the pavement. Still, some motorists still tried to power through the soupy mess as their wheels shot geysers of water onto oncoming traffic. A driver off Shallowford Road in Chattanooga got stuck when he tried to drive under a downed tree, Chattanooga Police Department spokeswoman Sgt. Jerri Weary said. Other drivers ignored barricades and their vehicles stalled on overflowed roadways, she said. As one car flooded and stalled briefly near the corner of 23rd Street and Orchard Knob Avenue, Steve Hilliard, owner of Household Pawn, supervised a group of men who worked to sandbag his front doors. Poking into a clogged drain with a shovel, he blamed city officials for the mess. "I'm doing the city's job for them," he said as the newly cleaned grate began to drain the accumulated pool of muck. "They ride around putting these barricades up all day, they could at least clean the drains while they're here." The deluge came after an August that was the driest on record in the Tennessee Valley. Roads started to close throughout Southeast Tennessee and North Georgia by mid-afternoon Monday, as strong winds and rain combined to make driving dangerous because of downed trees and power lines. Water rose all day, overflowing creeks and forcing the residents of one Fort Oglethorpe apartment complex to evacuate by boat. Flooding started in East Ridge Monday and then reached Chattanooga's south side. Still, the worst is yet to come, forecasters predicted. South Chickamauga Creek is expected to reach 25 feet today, well over the 18 feet considered flood level, said Loren Marz, a National Weather Service forecaster in Morristown, Tenn. That could cause major flooding in areas where the soil already may be soaked. Willie Birdsong places a cautionary marker on 23rd Street on Monday afternoon. But that could be a low estimate, WRCB-TV Channel 3 Chief Meteorologist Paul Barys said. "It's going to be a major, major problem," he said of the rising waters. The Tennessee Valley Authority, which operates a network of 49 dams on the Tennessee River and its tributaries for flood control and recreation, began spilling water early Monday through its Pickwick Dam in Southwest Tennessee, and began spilling at the Guntersville Dam in Northeast Alabama Monday afternoon to help move more water down the Tennessee River. If Chattanooga gets a full 10 inches of rain, the TVA is likely to spill water through its Chickamauga and Watts Bar dams, in addition to operating its hydroelectric units around the clock. TVA's upstream tributaries and lakes have been below normal summertime levels "and with the ground being as dry as it is a lot of this rain is being soaked up in the ground," said Chuck Bach, general manager for river scheduling for the Tennessee Valley Authority. "We're going to hold back water in our tributaries, which will bring those lake levels up, but it shouldn't be a problem." Not everyone bemoaned the extra water. Kenneth Fifer headed out on Monday afternoon to fill up his gas tank, hoping to beat the post-holiday Tuesday morning crowds. Work beckoned McDonald's employee Joseph Rodriguez, who chose to walk across town in the downpour, then take care of a few errands while he was out. "I figured that since I went to work, I might as well cash my paycheck and grab a burger," he said from under an umbrella that had been turned up by gusts of wind. "Maybe the flooding is bad in some parts of the city, but not everywhere." Though detours dogged motorists for much of the day, some residents took the opportunity to do a little urban kayacking, paddling through otherwise impassable city streets. Still others, including Ryan Keller and Matt Bond, headed down Main Street on foot for the pure novelty of seeing rain after a summer drought, despite their basement containing three inches of flood water. "It hasn't rained in such a long time, so we're just enjoying it," Keller said. "I'm glad it's raining, so we can finally swim in the river up in Soddy-Daisy." Schools in Bledsoe, Grundy, Marion, Rhea and Sequatchie counties will be on regular schedule today, according to officials. School officials across the western side of the region said a few trees were downed overnight, but no roads are closed. Officials said they would be watching creek levels throughout the day.